We have talked a lot about oils here on the Green Keratin Blog, with a particular focus on some of the wonderful oil elixirs within our range. However, we thought it was about time that we told you a little more about our Oils for Life. This week, I am going to be telling you all about the amazing skin care benefits of our Pomegranate Oil. If you’re anything like me, then you may not have realised that you could even extract an oil from a Pomegranate. Our luxurious Pomegranate Oil is extracted by cold pressing organic seeds from a pomegranate fruit. The Cold pressing is one of the best and most highly regarded methods for extracting essential oils within the skincare community. Essential oils have been used for hundreds of years to naturally boost health and beauty. Essential oils have so many different uses, so it is well worth adding a couple into your beauty cupboard. The great thing about essential oils is their potency, they are a completely pure form of oil that is highly concentrated. 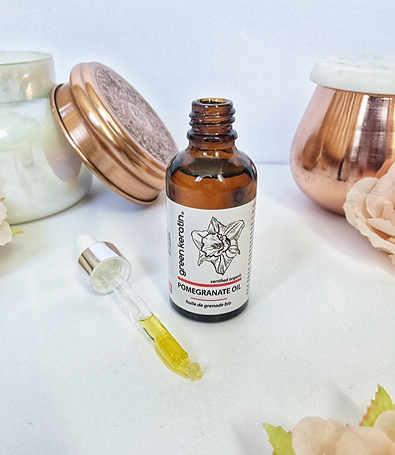 This Pomegranate Oil in particular is a great product for a first time essential oil user because it is suitable for all skin types, so everyone can feel its amazing benefits! So, how exactly can pomegranate oil help your skin? One of the best things about this Pomegranate oil is its many revitalising properties. 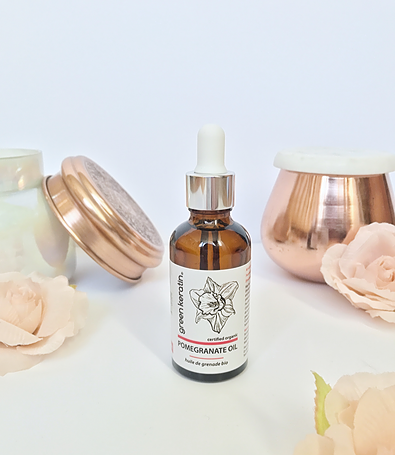 This oil is luxurious and rich in antioxidants, this means that it is fantastic at fighting off those pesky free-radicals that can severely damage the skin, causing premature ageing. One of the star components of pomegranate oil is Punic acid, which is a really unique polyunsaturated oil, this is a champion at fending off free radicals. Along with Punic acid, pomegranate oil also contains Ellagic oil and Tocopherols. Altogether, these ingredients help to promote collagen synthesis, thus revitalising ageing skin and helping to improve the skin’s elasticity. Pomegranate Oil also contains non-comedogenic oil which is perfect for helping to nourish and repair your skin. This oil helps to protect your skin against everyday environmental aggressors as well as stimulating cellular activity, leaving your skin looking and feeling at its best. Although you may not be able to see these aggressors, your skin suffers from their damaging effects every day. It is really important to give a little back to your skin and help it on the way to recovery. To top it all off, pomegranate oil works especially well as an anti-inflammatory. This makes it perfect for those with more sensitive or blemish-prone skin types. In fact, pomegranate oil is even suitable for those who suffer from eczema or psoriasis. Pomegranate oil is great for hydrating and nourishing dry and flaky skin, while calming any inflammation. 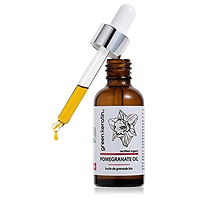 This pomegranate oil is perfect to be used both on the face and the body. It can either be applied to the skin neat, or you can dilute it by mixing a couple of drops in with your moisturiser. This oil is even suitable to be used on your hair! In fact, that is one of the things I love about this oil, it can be used for anything and everything, making it a perfect beauty staple. Pomegranate oil is able to deeply penetrate into the skin without leaving any kind of greasy residue on the skin. So it’s perfect to use right after you shower to lock in essential moisture.